We used to take pictures. Now we upload images. I know I’m not the first person to make that observation, but today there is more poignancy than usual to that sentiment. I can recall the summer of 1973 in aching detail. It was the last we would spend at my grandmother’s beach house, and being the last softens every memory in golden tones of nostalgia. We weren’t photographers, any of us, but we took a lot of pictures. I had a Kodak Instamatic, the black nubby-plastic one that you would attach a “flashcube” to for taking pictures in low-light. The pictures came back from the drugstore square with white edges. I can still smell the film cartridge and hear the distinctive snap of the film advancer. I didn’t know enough about good photography to know that I shouldn’t enjoy these pictures; I just took them. I captured random moments and posed impatient groups. Some are of my family, though not enough were taken of my shy grandparents; a few are of a silly gray kitten named Smoky I adopted that last summer. One I treasure particularly is of my eighteen-year old cousin and his two best friends, flexing strong-man biceps and hamming it up for the camera. They were beautiful, three tanned surfers, and I adored them. My awkward eleven-year old self believed that when they were mugging for my camera, they were flirting with me. In that same summer of 1973, Paul Simon had his hit song, Kodachrome, and I can still sing every word. We weren’t aware that summer would be our last at my grandmother’s house, which leaves it blissfully untainted by tearful goodbyes and unburdened by Lasts: last dish drying with my sister; last cuddle with a maturing gray cat; last screen-door slam. My Instamatic didn’t take Kodachrome but within a few years of that summer, Kodak stopped making the film cartridges and flashcubes it did take. All of it is consigned to history. So few of my photos now have the significance of being passed around a gathered group, relief or horror gasped after the first quick peek. 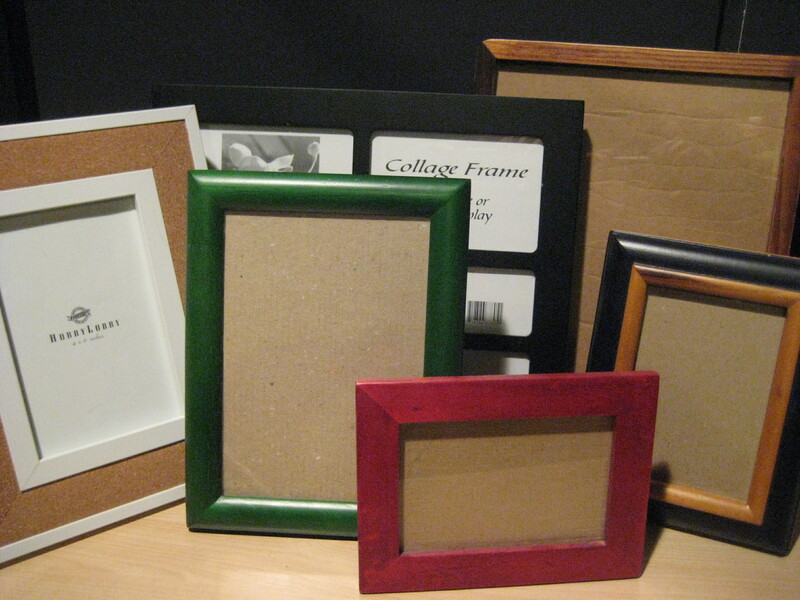 Even fewer are turned into actual pictures and put into frames. Digital frames are fine I suppose, but then again it’s not a picture, one precious picture, preserved and treasured. Yes, film fades, so do memories. 1973 and the beach and sweet pictures of summer-warm boys feel very far away. And Kodachrome. Makes you think all the world’s a sunny day. Most of us would say, “Anywhere;” to any lengths. And most of the time, we would mean it. We would then have to confront those nagging memories of inconvenience, when we didn’t answer the ringing phone, or offer to take the children, or visit the nursing home. Last Thanksgiving, my niece flew, and my sister, my brother and my mom drove 726 miles to share a few precious hours and one iconic meal with us. Last week, our best friends drove their three young sons 772 miles to celebrate Christmas morning with us. 726 miles and 772 miles, each way. That’s 2996 miles of love. In a lifetime, that’s probably relatively insignificant. In the span of a few weeks, that’s an intervention. Like so many right now, my family is enduring some tough times. The specific details vary; ours happen to be financial; others may be medical, emotional or spiritual. When you’re stuck in the middle of your particular pickle, however, the details matter less than the oppression. When, when, when. When will our life improve? When will my life improve? When?! “Now,” they say. Now we love you. Now we can be together. Now matters. An on-going debate on these pages has been about striking a balance between regret and reform. I regret, often and obsessively, past profligacy. Every ridiculously misspent, overspent dollar now haunts me. Can even one of those dollars be recalled? Can any be regretted back into my back account? Oh my, no. But if they could, my regret would be the engine of redress. So there’s no going back. But going forward, redeeming and reforming a profligate life, what does that look like? 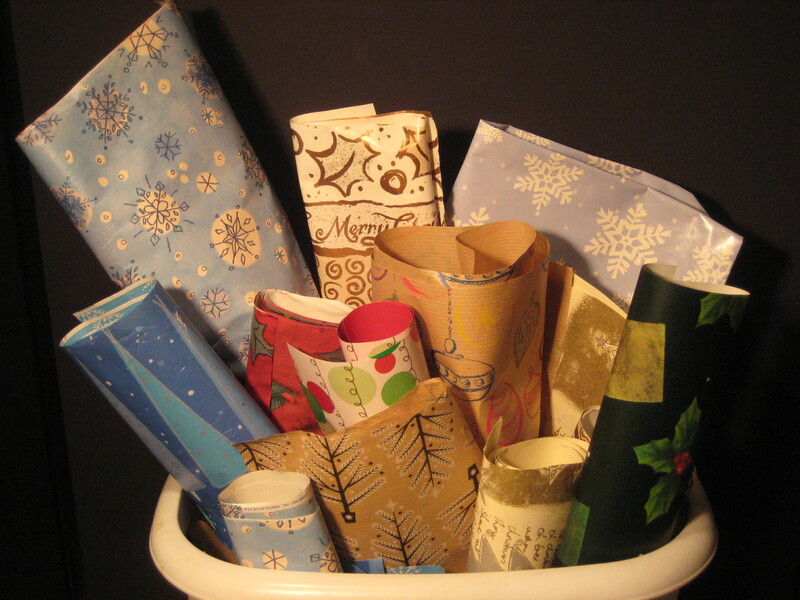 It looks a lot like that bin of old wrapping paper pictured above. As I downsize our possessions, through this project and through other calculated means, I have been asked if it wouldn’t be better just to hang onto our stuff, eventually use it up and not have the potential scenario of needing to repurchase something I am now downsizing. That’s a very thoughtful query, one I can appreciate in a way I cannot the “More is always better!” rebuff I have received. And truthfully, is there some stuff I am simply using up instead of downsizing? Of course! Candles come to mind. I have a great many decorative candles which I will systematically burn through for as long as they will last. An abundance of candles is my least concern. For the preservation of these, I feel no conflict, no internal debate. Downsize. 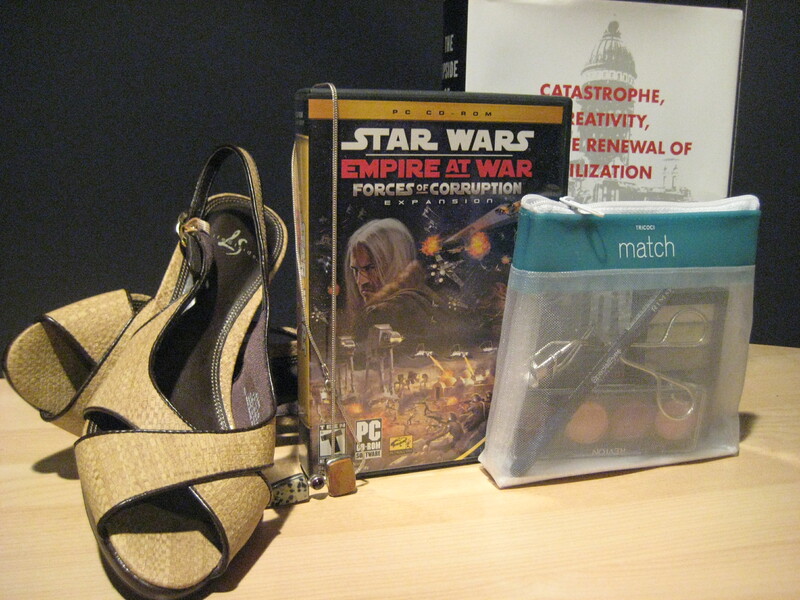 And so, our Christmas this year was themed around frugality, and one highlight was re-gifting. Our steadfast family and those same dear friends–those friends with the three boys who still believe– they accepted and embraced gifts from our downsizing efforts. Toys and clothes and books, gently used and specifically chosen, were wrapped as presents in whatever bits of paper could be found in the house. No new rolls of designer wrapping dressed up hand-me-downs: there was enough old paper and then some, if the gifter didn’t expect one continuous sheet to secret the gift under the tree. The effect was still beautiful; the sentiment was priceless. We’ve said our goodbyes, to our beloveds and also to some of our things. A new year quickly approaches. I can’t fly to anyone’s side to express my gratitude for all the love I have received this last difficult year, but in any way I can, in any way that truly matters, I would go to any lengths for each of you, my dears. "I don't even have claws, but I'll get blamed." That cute face poking through the tatters? Can’t blame her. At least not this time. I’m embarrassed to say, the hole in the sheet is from my side of the bed; from the vicinity of my feet, to be honest; under my right foot, to be painfully precise. Quick change of subject: One of the nice things about my 500 Things project is incorporating things into it that weren’t even on my downsizing radar at the start of the effort. Take this worn-out sheet, for example. Even if I had noticed a growing rip– and weirdly, I didn’t– I wouldn’t have replaced it any sooner. I simply would have mentally reconciled it to the Project. Sometime, in the next 242 days, but whenever, it would happen. No hurry. You see, I run a very minimalist linen closet: One set for each bed. 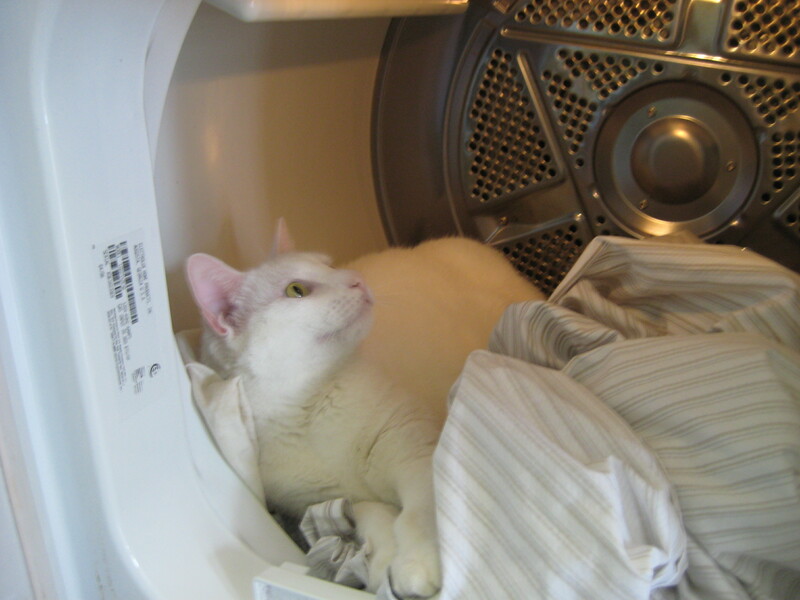 When the sheets need cleaning, they come off the bed, go directly into the washing machine, the dryer and right back onto the bed. Bonus: the mattress gets to air out during the process. I will be donating this sheet along with some other old linens to our veterinarian’s office. I’ve done this before, and they are so grateful for these donations. 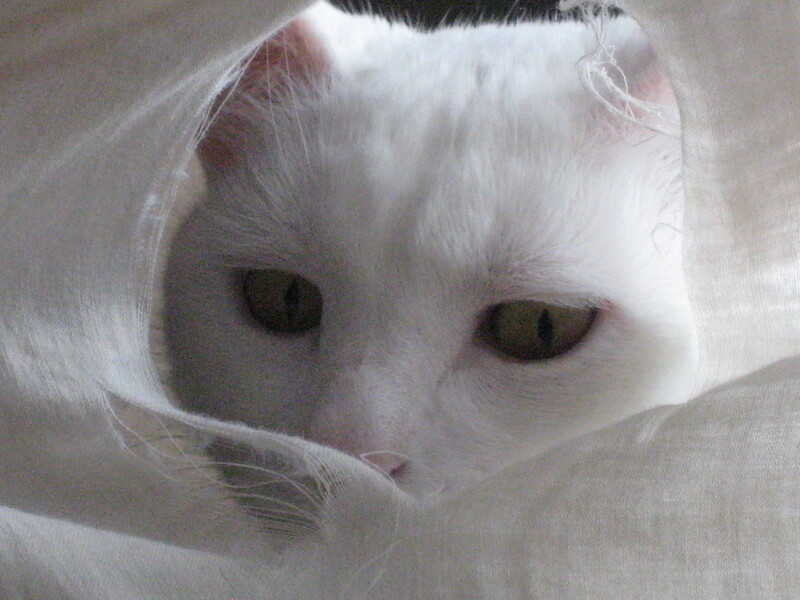 Vets and shelters go through a lot of linens with ailing and recovering animals. 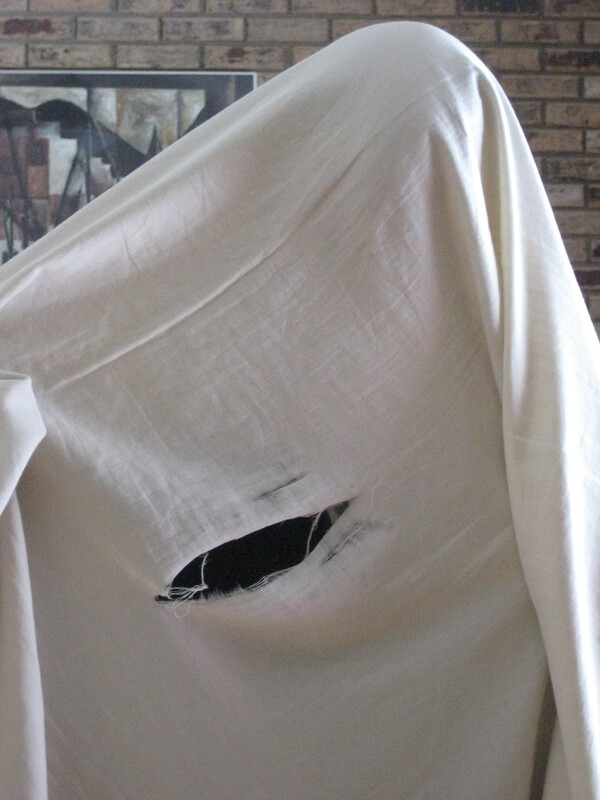 I’d like to encourage everyone to consider donating their worn-out sheets and towels. Of course, this particular donated item must be replaced. So, Paul and I treated ourselves to an early Christmas present: new sheets! I’m just wondering: Do you wash new sheets before putting them on the bed the first time? I do. Always have. I’m sure I got this habit from my mom. And now Paul and I have the treat of putting fresh new sheets on the bed. Stand back: We rock as competitive sheet changers! I wish my linen minimalism extended all the way to line-drying. I have such fond memories of hanging laundry on the clothes lines at my grandmother’s house. But that was summer at the beach. I live in Chicagoland, and right now it’s 22 degrees out. Someday, when the apocalypse is upon us and the electrical grid fails, I will line-dry. Zombie wreath: it just keeps coming back! The Reckoning has finally arrived. I said it on October 28 and way back in March: The Reckoning—i.e., the downsizing of my ridiculously over-sized collection of holiday decorations– was coming. Well, it’s here. And I know why I’ve been putting it off. 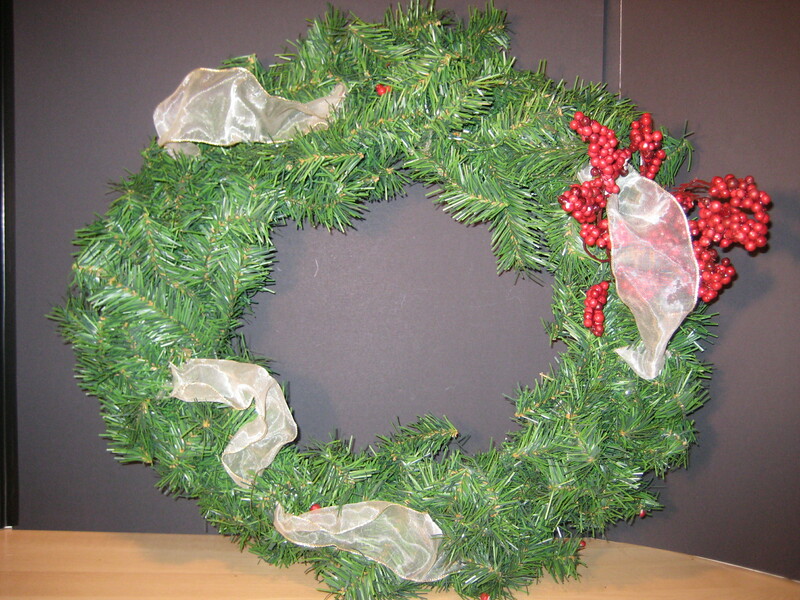 This tatty old wreath represents fatigue. Certainly the wreath looks tired, but not as tired as I feel every January 1st when the holiday decorations need to come down. By then, the tree has dropped enough needles to thoroughly mulch my garden; the ribbons, so enticing mere weeks ago, now bore even the cat; and a few more strands of twinkly lights no longer twinkle. The shine is off the show. On January 1st, as I dutifully return the baubles to their boxes and bins, it would be characteristically efficient to weed out the worn out bits before storing it all away. But have I? Or, year after year, being so exhausted and ready to banish the wretched excess of it all, have I returned even broken glass ornaments to their boxes? I wouldn’t need a “Reckoning” if I had achieved efficient scenario one. Post-holiday analysis: I vow to reduce and recycle anything that is blinking, broken, and beyond repair instead of slinking it back into storage. And no excuses this time! Please, hold me accountable! When finishing a job and confronted with the last few annoying tasks, I usually embrace the motto, “It will never be easier than it is right now.” And feeling my usual early holiday energy, it was pretty darn easy to downsize the tatty bits! I’ll let you know how perky I feel come January 1st. Confession: Relinquishing this one hurts. So why am I “relinquishing it”– a euphemism for the harsher “getting rid of it”? Well, I am gratefully acknowledging the energy of my readers. I received two interesting comments on yesterday’s post, Decidedly Athwart. One was from a local friend who said he was just not ready to give up his books, records or CDs, even though having more room is a “meaningful” pursuit. The other came from a local librarian, whom I do not know personally, expressing appreciation for my support of public libraries and promotion of a less cluttered life. The librarian also reminded me that I had just reached a milestone in my 500 Things Project, and milestones deserve recognition. It’s true: I have reached The Halfway Point. The numbers counting up the 500 Things I am getting rid of are getting bigger; the numbers counting down to the Self-Contained Unit’s departure for college are getting smaller. That’s all part of the gig, right? Increasing one, decreasing the other: It’s built-in accounting. I am acknowledging that I do not have to own the books to enjoy the experience of them. This is key. 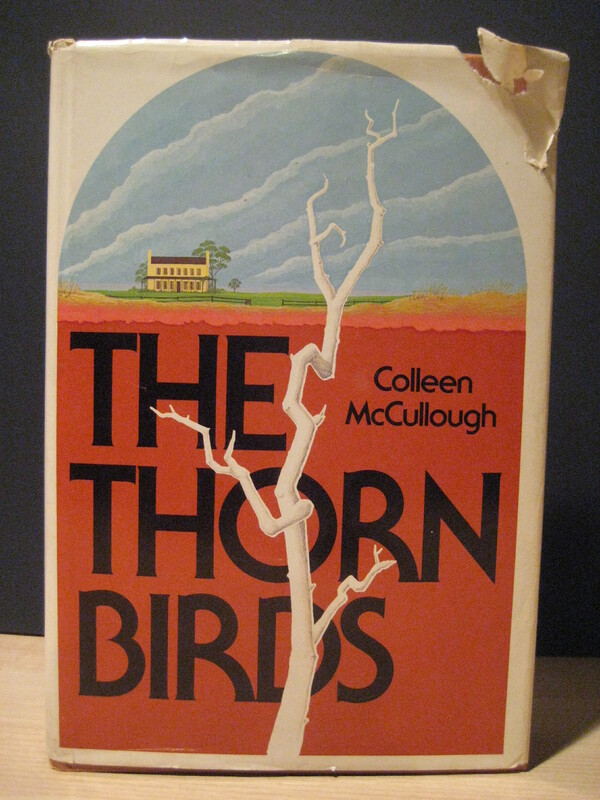 I loved The Thorn Birds. I read it at precisely that right age for this “forbidden, forever” romance to resonate deeply. And then: the miniseries came out. Oh, how I ached, how I suffered for Meggie and Ralph. And their story, gorgeously depicted, fabulously scored, remains one of the Best Things Ever on TV. Yes, I love the book; I always will. Sooner or later, however, to get what I really want, I am going to have to start letting go of Things that are loved. We own, I own, too much stuff. We have to house it, maintain it, provide insurance for it. I worry endlessly about the sump pump failing and a flood destroying it– again. Enough is enough. Enough money being spent on stuff. Enough energy being spent on stuff. Enough being controlled by my stuff. My friend Melanie told me about a friend’s father who made a commitment to his children that, upon his death, he would provide them with a profound gift: a perfectly clean basement. Downsizing the stuff does not diminish the life; in fact, I would say decreasing one, increases the other. It’s just part of the gig. Truly, I am athwart. But does that mean I am off-course, or simply not taking the expected course? Very few people express outright skepticism that a rejection of excess is misguided. And no one has yet responded to my mission with a defiant, “No! I embrace over-indulgence!” But most people do pretty quickly press the pause button. They want to establish boundaries, and they want my permission to negotiate them. No permission requested from the book crowd. Everyone has some non-negotiables, me included; and most of the time not even a lawyer should negotiate your non-negotiables for you. [Insert medical/psychological disclaimer here.] I recognize that I am on an unexpected course, and my path-less-taken certainly follows a different course from yours. What would be comforting is if we each had a sense of where we are going. And that’s where I am athwart. I am not sure where I will end up, where my family will end up. Where will Sam go to college? Where will Paul and I land? But of this much, I am utterly and completely certain: Wherever it is, we will surely be a more streamlined version of ourselves. And our particular Cheshire Cat doesn’t smile and isn’t much for philosophizing, but, remarkably, she does come when you whistle. That can be very handy when you are feeling lost and a bit athwart. Why do so many of my stories end up in the woods? It’s not like I’m Pocahontas or anything. Although I am part Powhatan Indian. It’s true. 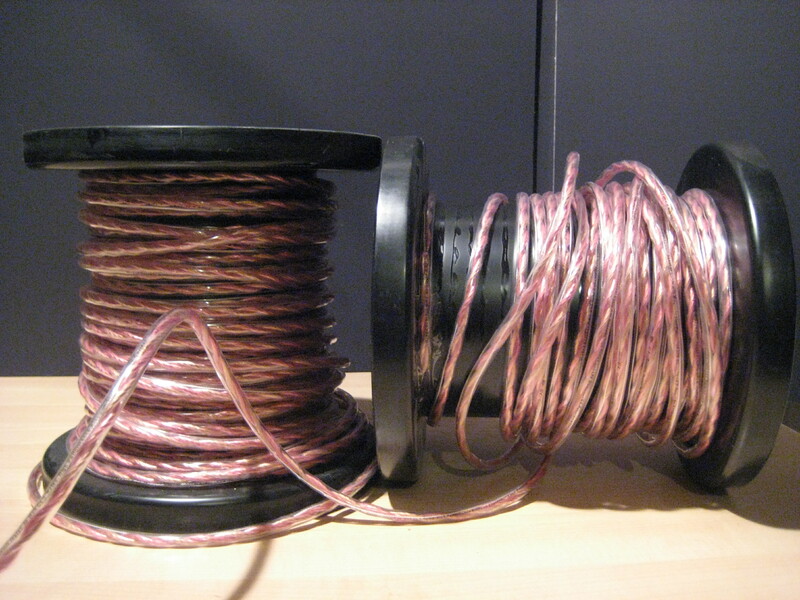 Remember using speaker wire? You had to carefully strip off a bit of the plastic, uncovering the numerous fine wires while trying not to cut any of the wires, so you could make a connection with the exposed wires through these teeny tiny pincher-thingies. Ridiculous system, but we did what we had to do to have the tunes. So Erin and Lauren volunteered to assist. Note: Children always enjoy making their older relatives look lame, and older relatives don’t mind adolescent eye-rolling, if, in the end, they get some work done for free. It quickly became clear from the eye-rolling that we were woefully short on room-to-room speaker wire, so I handed the girls cash to buy some at a nearby Radio Shack. Erin eyed the wad of cash questioningly.